Leveraging data to boost process efficiencies of supply-chain logistics or to shorten delivery times—or both—is becoming more difficult with every terabyte of data shippers and receivers store. Even though leadership at some surface transportation companies have implemented big-data algorithms and data visualization in their attempts to mine the data, these information-analysis techniques to drive better decision making need to be enhanced with additional cutting-edge computing strategies like artificial intelligence, cognition and robotic process automation. Artificial intelligence, or AI, and cognitive computing are similar in their abilities to evaluate data. According to iQ, Intel’s online tech magazine, both help humans solve complex problems like a medical diagnosis. If both had to determine a treatment plan, AI would tell the doctor what to do based on its analysis. Cognitive computing would provide information to help the doctor decide what to do. Ditto in the transportation world. One application of AI in the supply-chain realm is poised to take off in 2018, according to Adam Compain, CEO and founder of ClearMetal, a provider of AI. One of its greatest uses will be to clean data throughout the supply chain. Compain made the comments in videos with logistics analyst Adrian Gonzalez at talkinglogistics.com. In addition to being dirty, data is often stuck in silos within various logistics partners. Compain said that AI solves the data problem. AI makes sense of data, allowing people to be more strategic at proactively managing exceptions. In the case of a large supplier, he said, using clean data helps the company know where goods are coming from and if they are on time. AI would also help procure the right kind of freight carrier and assess any risks about when and how those goods will arrive at their destination. Cognitive computing is being applied by a leading developer of the technology, IBM, to its own supply chain and thereby putting it to a real-world test. According to Joanne Wright, Vice President of IBM Supply Chain, the tech company wants its not to just think and learn, but also to understand. More specifically, IBM connected its cognitive computing capability, known as Watson, with weather information from around the globe. The technology combination notably was able to predict when a hurricane would hit near a manufacturing site in Guadalajara, Mexico. The forecast allowed the company to make decisions that avoided some otherwise unplanned costs and resulted in satisfied customers in other parts of North America because their products were not delayed. According to Wright, a second enhancement to its cognitive computing for logistics brought in social media capabilities, which she said provides real information on what’s happening in a particular country, city and time. Bringing together structured and unstructured data provides for better decisions. As Watson’s cognitive computing capabilities have grown, IBM launched an app that is available to all IBM employees and suppliers. She describes this transparent information capability as a way for all involved in the supply chain to be more collaborative. That enables all involved to act more quickly. Robotic process automation, according to Deloitte, “holds the potential to computerize a variety of manual processes,” like data entry or order processing. The “robots” are actually software that can interact with various business applications. Research by the firm showed the cost of a software robot is significantly less than the operators it replaces. For example, a medical insurance company cut its claims-processing costs by 44%. Other benefits include more consistent data that is less likely to have errors, better deployment of human resources and enhanced regulatory compliance thanks to the more accurate data. 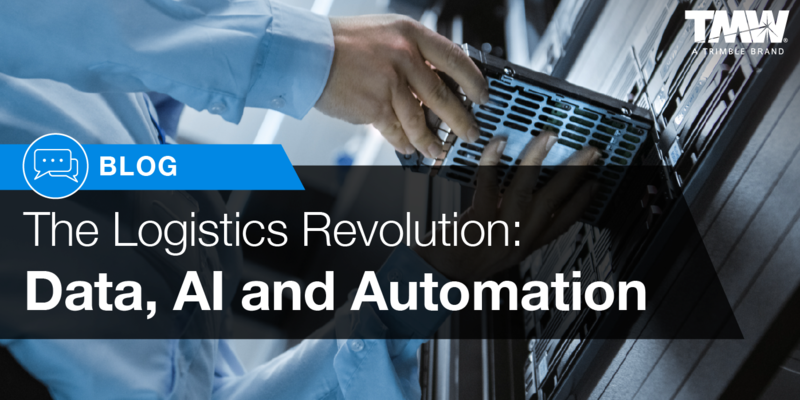 Data-driven supply chain logistics will continue evolving as companies implement strategies and tactics to improve performance. Data will continue to be amassed at exponential rates, but as Compain cautioned, success is not about who has the most data. It’s about choosing the right tools to ensure data integrity, accuracy and visibility that will improve supply chain logistics. Ready to join in the logistics revolution? Leverage your transportation company data to boost process efficiencies of supply-chain logistics, shorten delivery times or explore other uses for your business success with TMW.